Professor Walji obtained his PhD in Pure Mathematics at the California Institute of Technology. He has held post-doctoral positions at the Ecole Polytechnique Fédérale de Lausanne and UC Berkeley, as well as visiting positions at the Humboldt-Universität in Berlin, ETH Zürich, the Université de Montréal, and, most recently, at Occidental College in Los Angeles. He also received a Forschungskredit grant in 2015-16 to work on L-functions at Universität Zürich. 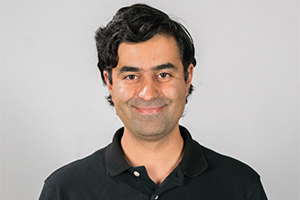 Professor Walji's research interests lie in number theory, specifically the study of elliptic curves, modular forms, and automorphic representations, often through the perspective of L-functions. He has worked on questions relating to the Lang-Trotter conjecture, the distribution of Satake parameters, and refinements of strong multiplicity one for automorphic representations. He joined The American University of Paris in 2017. Supersingular distribution on average for congruence classes of primes. Acta Arithmetica 142 (2010), no. 4, 387-400.